Dye Proto Alu Air Tank (48/3000) + Regulator. 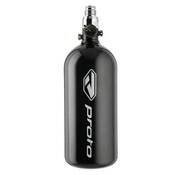 The proto air system has an aluminum bottle with a steel core. A very reliable and reasonable air system ideal for beginners. The Volume of this bottle is 0.81 liters (48ci) with 3000 psi (200 bar). The bottle is Pi approved. It comes with a regulator.